The packaging of Coyopa Rum is a classy mix of old and new. The square bottle and large, wood-handled cork reminiscent of rum’s fine heritage, as does paper seal, complete with handwritten batch numbers and distiller’s initials. But on closer inspection, the busy background of the colorful label is actually various images of a dancing couple, which gives a slight hint of modernism and trendiness. Personally, I enjoy the old-style found in many rum bottles, but in this case the blend seems to work rather well. The rum inside is a rich, clear amber, and to the nose it smells cool and uncomplicated. Brown sugar is dominant beneath the chill, and little else makes itself immediately known. The taste of Coyopa is much like the smell – simple and good. But it’s also surprisingly smooth. This is a rum that tastes first and foremost of rum – true and basic. But where this often results in a somewhat intimidating, or even harsh drink, with Coyopa it’s almost dangerously mellow. A good basic rum, especially for those newer to the field, or who’d like a happy medium between the heavy dark rums and the sticky sweet lighter ones. 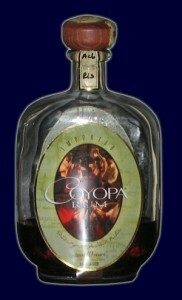 This entry was posted in Rum and tagged amber rum, coyopa by Bilgemunky. Bookmark the permalink. This is my video of the Coyopa musical rum bottle.